Well after a impromptu house move (like you do) I was a bit too busy to continue with the build. And the control panel enclosure. Are you using electric valves? My only comment would be to add manual valves on the outlet of the pumps to control the flow rather than use speed controllers, assuming you are using mag pumps which it looks like you are. Are you bottom filling the mash tun? I went with a separate inlet on the mash tun for underlet filling rather than use the outlet. It made it easier for planning the lines and valve configuration. Although I decided against 3 way valves and have all 2 way, but I also use 3 pumps which made it easier to configure the flow. Each vessel has it's own pump on the outlet. The MT pump handles the recirculation and also later pumps to the boiler. 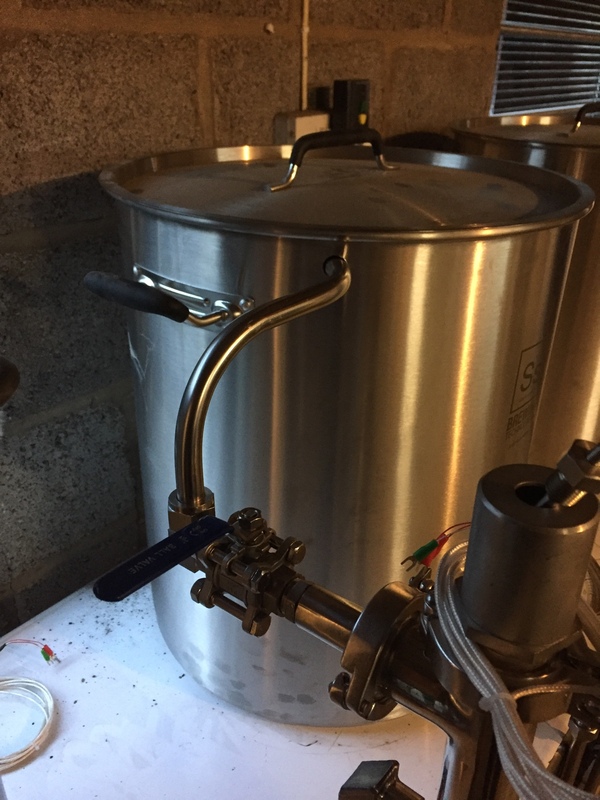 The LT pump recirculates the water during heat up to avoid layering and ensure an even temperature then fills the MT and also handles the sparge flow. The boiler pump is used to recirculate through the chiller and then into the FV. Hope that makes sense. But I'm gong to trial one at the weekend because I know the pumps speed to flow ratio isn't linear. Even if that is a success I'll still need a valve on the RIMS to keep it full, I'll ammend the PFD. Thanks for that. I do underlet, it worked a treat on my old system using gravity but on this I will have to pump. I can throttle the flow on the MT valve. If I add another inlet on this 2 pump system it will make the pipe work more complex so I'll stick with underletting from the outlet unless I change to 3 pumps. That's a great idea recirculating the HLT, it's a problem I did foresee but thought about just giving it a stir with the wooden mash paddle. Have you any pics or drawings of yours? Why did you use 3 way valves? I have only just changed to 3 way to reduce the amount off joints and fittings. And no, they are all manual. I looked at full automation using a PLC and HMI (touch screen) but it would have doubled the build time and cost even though I have a PLC I could have used. Last edited by LeeH on Fri Oct 16, 2015 12:28, edited 1 time in total. This was my layout. 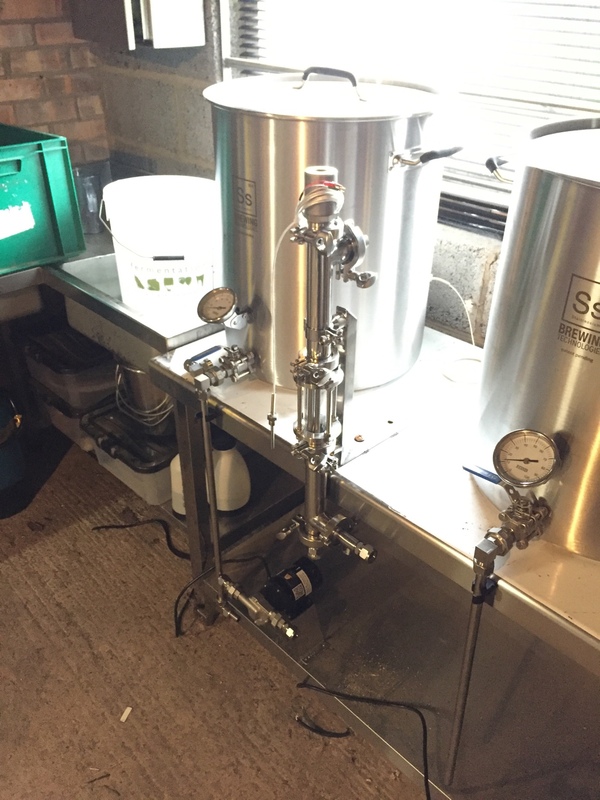 In reality the HLT is above the MT and the boiler is level with the HLT. The diagram doesn't show the manual valves used to throttle the pumps. I omitted the float switches and the pressure sensors for now, as my DX1 unit was dead on arrival and the company have gone out of business so went to plan B, and all the valves are controlled via switches on my panel. What valves re you using? Can they handle the flow directions you want? 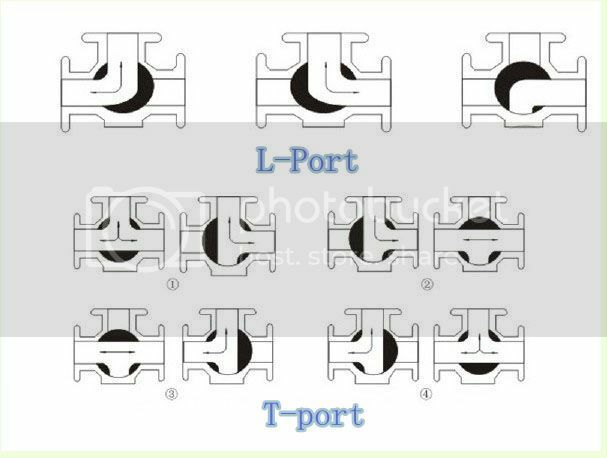 I don't have three way valves, but my understanding of them are that they come in two configuration L & T.
I'm using the T type so I can use them in any configuration. Just waiting for the valves to arrive from China now....could be weeks. Super idea thanks, I'll have a look for one. The panel isn't built yet so it's no bother slipping one in. i have one of those and i took it off in the end, its a good plan but you need pressure to open the switch in the first place. The problem i found was i could not prime the pump with it. Its a bit like dipping a straw in water with your finger over the end and you get no water going up the straw. I guess it just needs a bleed before the switch then? LeeH wrote: I guess it just needs a bleed before the switch then? Pump = Ball Valve = Tee Piece with Bleed Valve = Flow Switch ? Yes I was always gong to put it on the outlet but as suggested it will need a bleed which I think I can do with the existing set up. I can bleed some through with the drain point. obviously the pumps need to be flooded so your going to be losing anything in the lines. Pi R squared times the length of the tube will give you its volume (inside radius..), but not all will represent the dead volume of the pipework, and suitably positioned drain valves should let the last runnings get jugged into their destination..